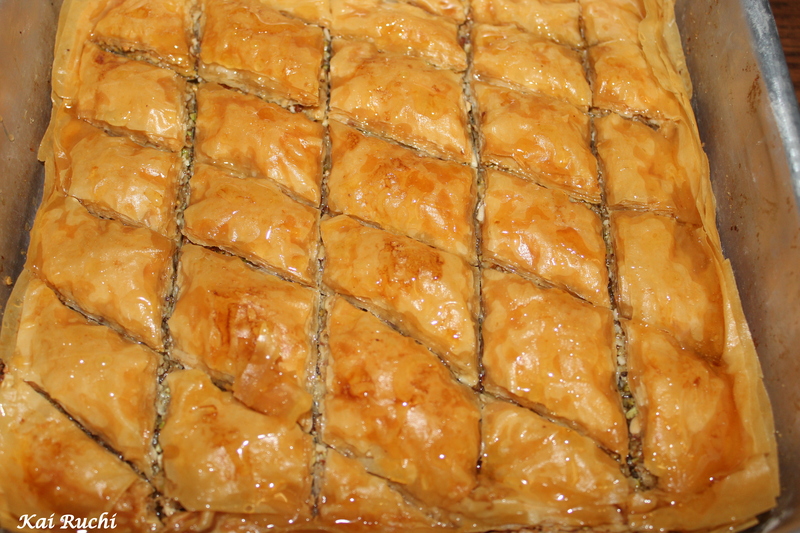 Last month, my friend invited me for a potluck party, I agreed and I decided on making Baklava. I had made these before and was comfortable preparing it the second time too.. but here comes the trouble..
Baklava’s were baking and I kept the syrup on stove and forgot to start the timer. BUMMER! Meantime my son started throwing tantrums and had to be with him for a while and completely forgot about the syrup boiling. When I was back to the kitchen, my syrup had crystallized and had to redo the syrup all over again! Thankfully I was ahead of time and prepared the syrup right on time when the baklava’s just finished baking. All in all, never forget to start on your timer 🙂 Baklava’s turned out nicely and everyone enjoyed eating it! Preheat oven to 350 degrees F. Butter the bottoms and sides of a 9×9 inch pan. Chop nuts and toss with cinnamon. Set aside. 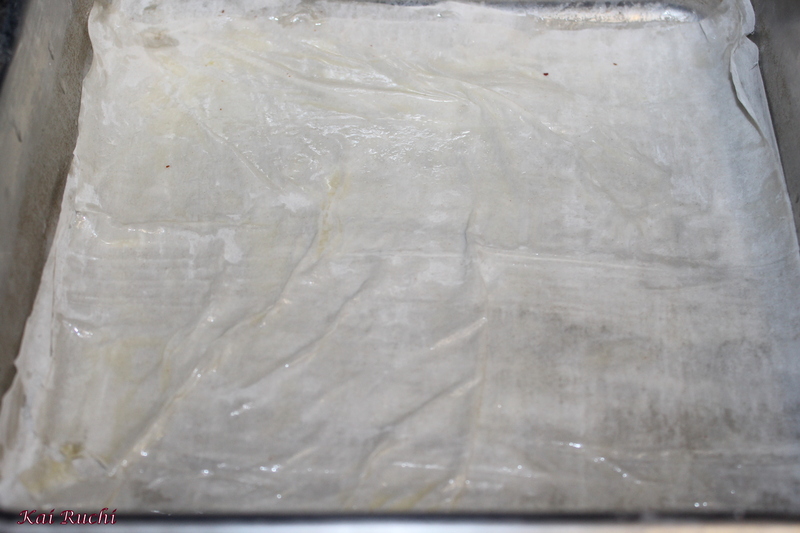 Unroll phyllo dough. Cut whole stack in half to fit pan. 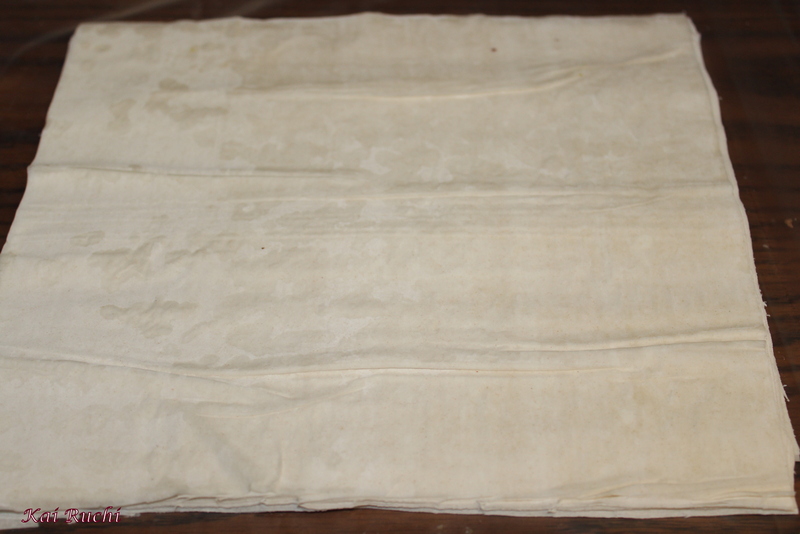 Cover phyllo with a dampened cloth to keep from drying out as you work. Place two sheets of dough in pan, butter thoroughly. Repeat until you have 8 sheets layered. 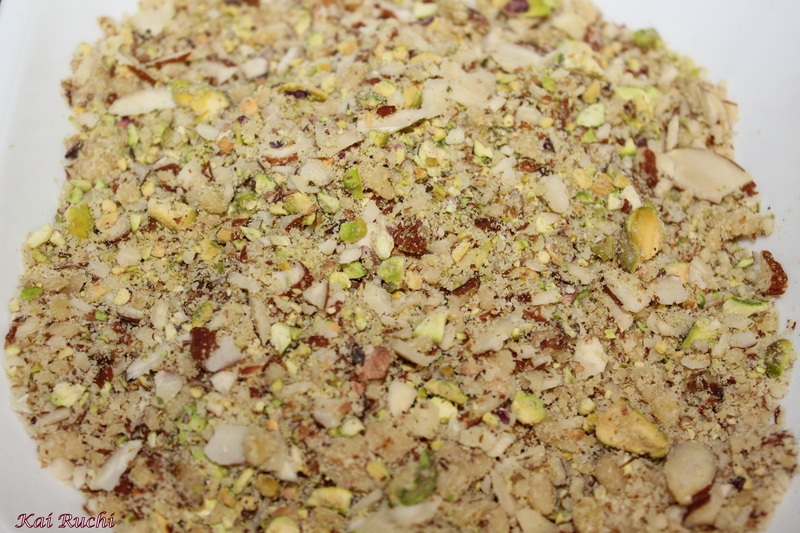 Sprinkle 2 – 3 tablespoons of nut mixture on top. 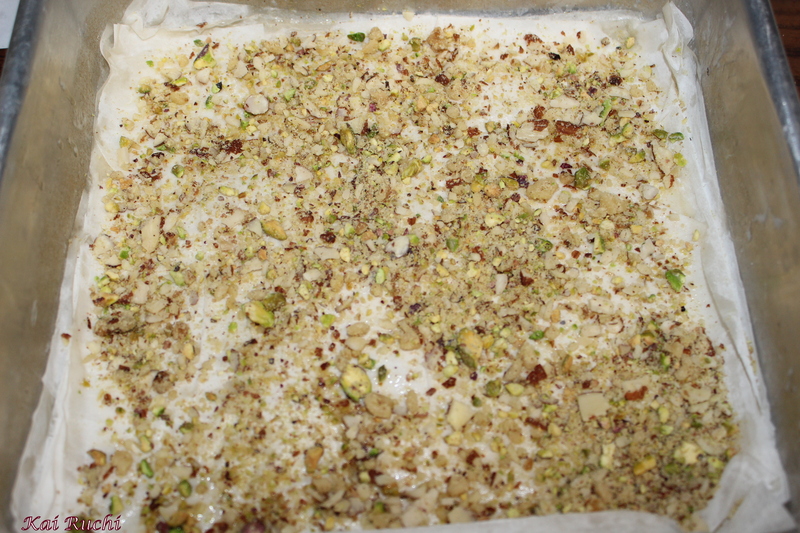 Top with two sheets of dough, butter, nuts, layering as you go. The top layer should be about 6 -8 sheets deep. Using a sharp knife cut into diamond or square shapes all the way to the bottom of the pan. Make sauce while baklava is baking. Boil sugar and water until sugar is melted. Add vanilla and honey. Simmer for about 20 minutes. 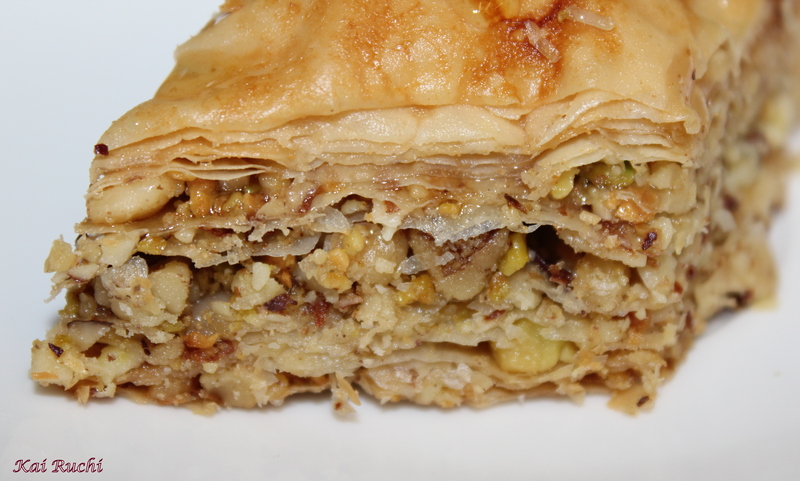 Bake for about 50 minutes until baklava is golden and crisp. Remove baklava from oven and immediately spoon sauce over it. Let cool. This freezes well. Leave it uncovered as it gets soggy if it is wrapped up. Thanks and wish you a very happy new year too! Thanks Nazneen! For a second I really thought I ruined the whole batch…. It looks awesome! Wishing you a Blessed New Year! Thanks Nora! Wishing you a very happy new year too! 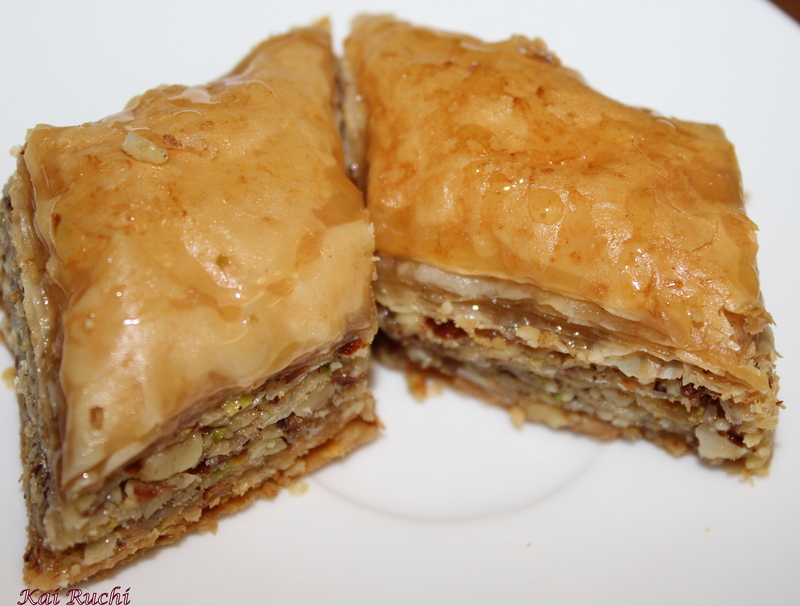 I love baklava and this one is a beautifully made! Thanks Katrina! You should be an expert in this…. Thank you so much for posting so many great recipes from Karnataka. 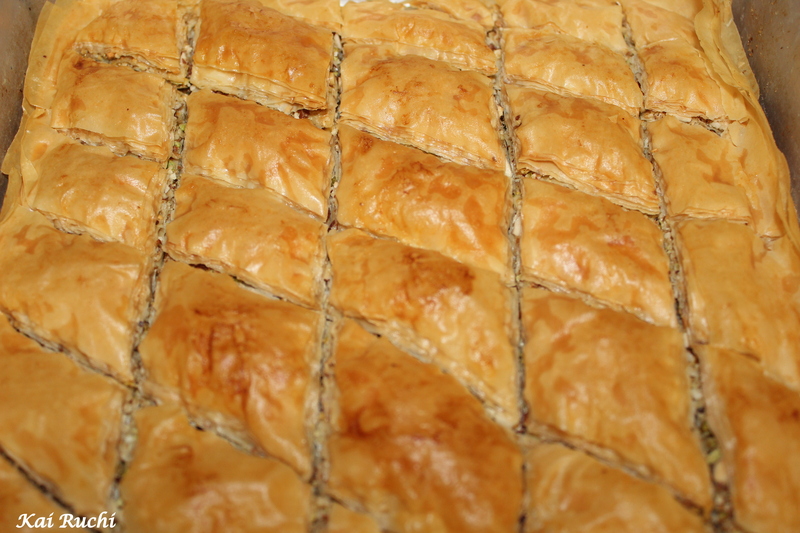 Baklava has been on my list of things that I really want to bake for the longest time. 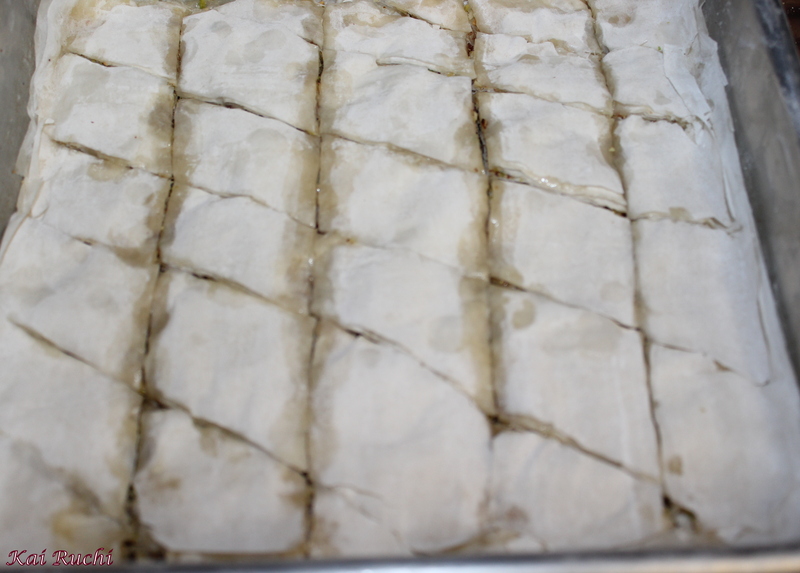 Yours turned out so wonderful looking that I feel that I can now tackle the baklava project – what a wonderful recipe and great pictures too!